Repetition Creates Belief. Repetition Creates Belief. And Reinforcement Cements It In. 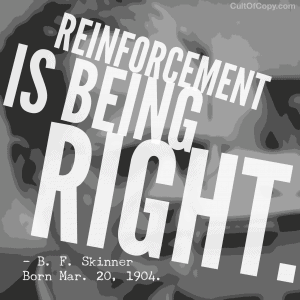 “Reinforcement is being right.” – B. F. Skinner, Born Mar. 20, 1904. Read this. It'll change your life. Your business and money-making life, anyway. And that usually changes your home life. Having money and fame will do that. So first, gather an audience. Build it up around what you sell, or find existing ones and milk them, or just pay to target ads at your primary prospects. The point of having an audience at all is to deliver information to them. Stuff about what they should know about their problems, and the available solutions, and what they should buy and when and from whom. And once you have an audience hungry for it, the method of imparting this strategic information to them – stuff you want them to retain, absorb, internalize – is to simply repeat it. Yes, repeat it. Just keep repeating it. Sounds simple because it is. Not verbatim. But in different configurations. Keeping it interesting. Use different stories to impart it. Use real life examples to reinforce it. But the core concept you're trying to push is always the same. Through this practice of repetition and reinforcement, you can implant beliefs… and if you can guide beliefs, you can control behavior. In other words, if people tend to believe what you say, you can get them to buy stuff. That's as simple as I can put it. Trusted advisors can easily profit from those who trust their recommendations. But that is the trick – we aren't talking about something so simple as telling people the truth to prove that you're trustworthy. Too simple. Too limited. We are talking about FORCING people to believe you, even if what you're saying IS NOT TRUE. That's where the actual power and influence are. Anyone can get people to believe REAL things – that just takes proof. But to get people to believe in things WITHOUT proof, you need repetition and reinforcement. Now, I'm sure some people reading this are thinking I mean all kinds of nefarious things when I talk this way. But listen, the idea that your customer needs to buy your brand of surfboard wax or whatever, and that it's urgent, and that they should buy two bottles and save some money… That's not really TRUE. That's not real. You can't just prove that to be a fact. But you want them to BELIEVE it, and then BUY based on that belief. So you need to repeat it. Every day to whoever is listening, in a million different ways. And then you need to reinforce it by showing them why. And show them how it's better to have it. And worse not to have it. And how it's wise to get it. And foolish to pass. And cool to own it. And lame to not have any. Etc. That makes it REAL. It makes you RIGHT. And when you're right often, your audience tends to do whatever you tell them. Like you, reading this.